Asked for their one-word impression of Joe Biden, more people use negative than positive words to describe the vice president. Many of the negative words disparage Biden’s competence and performance, with idiot, incompetent and clown among the terms used most frequently. Of those offering a word to describe Biden, 38% use negative terms, while 23% give positive words. About four-in-ten (39%) use neutral terms, with vice president among the most common, according to the latest national survey of 1,008 adults by the Pew Research Center and the Washington Post, conducted Aug. 31-Sept. 3, 2012. The top positive words used to describe Biden are good and honest. Many of the negative words focus on Biden’s intelligence: Aside from clown, a number of people describe Biden as stupid, a joke, goofy and a buffoon. Ryan’s relative youth and inexperience are a theme in his descriptions, with young among the top words used. In contrast, Biden is often described as old. There are wide partisan differences in one-word impressions of Biden, but even Democrats are not highly positive about the vice president. 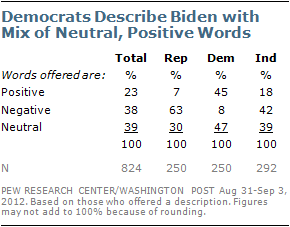 As many Democrats use neutral words as positive words to describe Biden (47% vs. 45%). 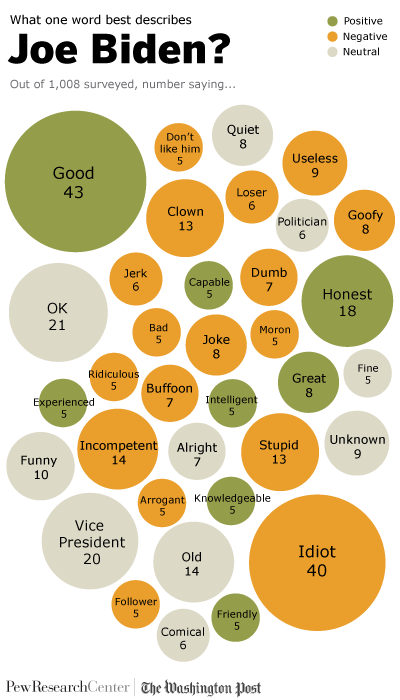 Republicans generally use negative words to characterize their impressions of Biden (63%). Among independents, more than twice as many use critical as positive terms to describe Biden (42% vs. 18%).